Beth & Cory's Mom: What's So Great About This Thing They Call a Dishwasher? What's So Great About This Thing They Call a Dishwasher? I never had a dishwasher until we moved to this house a couple years ago. Unless you want to count the kids who mainly just grumbled about having to do something around the house and seemed to have a hard time actually getting things clean. Thinking about it now, they probably did that on purpose so they could hopefully get out of washing dishes in the future. And it worked way more than it should have. When we built our house in Wisconsin, I had the choice of putting in a dishwasher or just having a cabinet in the spot next to the sink. I chose a cabinet, because you can never have enough storage in the kitchen. And I didn't want to pay extra to have the dishwasher. When we moved here, there was already a dishwasher. We did end up buying a new one when we bought our new refrigerator so that it went with the other appliances better, and we gave the one that was here to Beth, along with the washer and dryer. You'd think, because we actually spent money on it, that I would actually use the dishwasher, and I have - a handful of times. I just haven't figured out what's so great about it yet. It seems it takes longer to figure out how things are supposed to go into the dishwasher than it actually does to just wash the dishes. Seriously, I really have no idea how things are even supposed to go in there, and I just end up getting frustrated. And then there are the things that can't go into the dishwasher - wooden handled knives and wooden spoons that will dry out, silicone scrapers and plastic things that will pick up the smell of the dishwasher soap and hold onto it for ages, anything that will rust if it's not dried right away, etc. The only things left that can actually go into the dishwasher are usually glasses, plates, bowls, and other easy-to-wash things. I mean, I suppose at least I wouldn't have to wash those, but if I have to fill the sink with soapy water to wash all the other things, it seems silly not to just go ahead and wash everything while I'm at it. Considering it takes 2 to 3 hours for the thing to run, it's definitely quicker to just wash the dishes and get it over with. Also, there are only two of us. 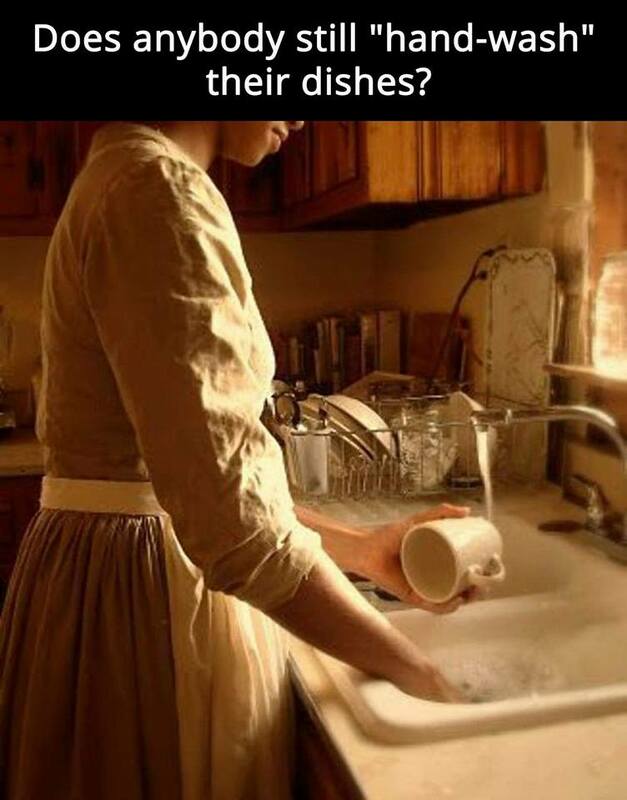 There are definitely dishes every day, but it would take several days to fill the dishwasher up with the things that can actually go in there. My thought is that it takes the same amount of water, power, detergent, and time to run the dishwasher no matter how full it is, so there's no reason to run it unless it is completely full. It would just seem wrong. The problem with that is there are things I use on a regular basis, and I need to have them clean before I'd ever think of running the dishwasher. So, even if I loaded things in there, I'd be pulling them out again so I could wash them and use them. I usually wash dishes after dinner, stack them in the drainer to dry overnight, and put them away in the morning while the coffee brews. It works perfectly because I hate drying dishes. If the dishwasher runs and I don't remember to crack the door open so air can get in overnight, unloading and putting the dishes away also includes drying. Did I mention that I hate drying dishes? Honestly, I have a hard enough time getting my hands dry sometimes, let alone trying to get dishes dry.